BACKGROUND/PURPOSE: Postoperative infection is the most disastrous complication of penetrating keratoplasty (PK). Corneoscleral rim culture provided information regarding subsequent infections. Our aims were to identify the incidence of microbial contamination in donor corneas and to report the recovery of bacteria with two culture methods, i.e., conventional culture media after aerobic/anaerobic cotton swabs and blood culture media (Fastidious Antibiotic Neutralization [FAN]). MATERIALS AND METHODS: A total of 118 patients underwent PK. Corneoscleral rim cultures were performed using aerobic/anaerobic culture cotton swabs (Transystem™, COPAN, Italia) with subsequent convention media and blood culture media (FAN bottle, BD BACTEC™, USA). The results of the different methods were reported and analyzed. RESULTS: Microorganisms were recovered from 24 in total 118 cases (20.3%, n = 118), 14 from blood culture media (FAN) (11.8%, n = 118), 9 from conventional culture media after aerobic/anaerobic cotton swabs (7.63%, n = 118), and 2 from fungus culture (1.69%, n = 118). 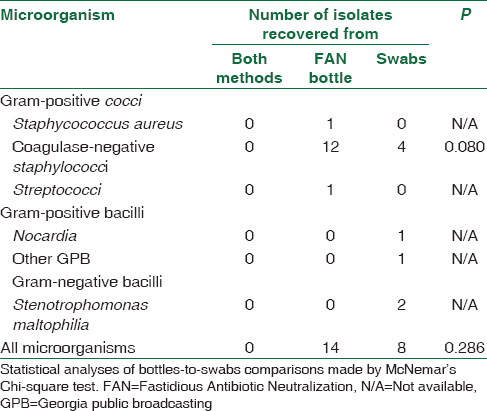 The most commonly identified pathogen was coagulase-negative Staphylococcus (CoNS) (n = 13, 54.2%), and more isolates of CoNS and staphylococcus aureus were recovered from blood culture media (FAN) than those from conventional culture media after aerobic/anaerobic cotton swabs (13 vs. 4, P= 0.05). Conversely, more nonfermentative Gram-negative bacilli were recovered from conventional culture media after aerobic/anaerobic cotton swabs. None of the 24 cases with positive corneoscleral rim cultures reported ocular infection for the recipients in at least 6 months' follow-up. CONCLUSION: The conventional culture media after aerobic/anaerobic cotton swabs and blood culture media (FAN) did not yield identical isolates of bacteria. The blood culture media (FAN) could further yield Gram-positive bacteria in addition to those recovered from convention media. It seemed adding gentamicin and streptomycin could achieve bacteriostatic effect instead of the bactericidal effect. The administration of postoperative antibiotic in the recipient was suggested. Nan-Ni Chen, and Pei-Lun Wu had equal contribution to this work. Keratoplasty (corneal transplantation) is a surgical procedure where a damaged or diseased cornea is replaced by donated corneal tissue (the graft). Infections, following penetrating keratoplasty (PK), including microbial keratitis and endophthalmitis, are devastating complications and the incidence has been reported to be approximately 0.2%–0.77% for endophthalmitis and 6.5%–10.5% for microbial keratitis.,, It resultsin further surgery, including therapeutic PK with an incidence ranging from 9.5% to 30.7%; and evisceration from 7.1% to 9% in those infected eyes,, Recently, it is debated for routine culture involving corneoscleral rim during implantation on the basis of cost-effectiveness.,,,,, However, microbiological testing of media and/or remaining scleral rim postoperatively is still recommended by the Eye Bank Association of America and the European Eye Bank Association., Since the corneoscleral rim cultures could benefit in earlier infection detection, and the better detection rate for aerobic and anaerobic microbes becomes a crucial issue. In literature, these were inconsistent methods in obtaining microbial culture at cornea transplantation, involving conventional culture media after aerobic/anaerobic cotton swabs or blood culture media. In fact, complex issues including different antibiotic supplementations of the preservation medium and types of culture medium to increase positive detection rate from aerobic and anaerobic microbes were involved in corneoscleral rim cultures. Conventional culture media after aerobic/anaerobic cotton swabs usually were composed of blood agar, chocolate agar, and thioglycolate broth in cultures of the corneoscleral rim,,,,,,, Recently, blood culture media (Fastidious Antibiotic Neutralization [FAN]) which contains agents for neutralization of antibiotic were developed to alleviate the influence of added antibiotics.,, Indeed, the modern cornea storage media such as Optisol GS, which contained gentamicin and streptomycin could possible result in a higher false-negative recovery rate. The current study aimed to report the culture result of corneoscleral rim at transplantation surgery from conventional culture media after aerobic/anaerobic cotton swabs and blood culture media (FAN). The medical charts of 142 patients receiving PK from January 2000 to January 2017 in Chiayi Chang Gung Memorial Hospital were reviewed. All patients receiving PK were prescribed wide spectrum topical antibiotics after surgery. Twenty-four patients were excluded because of lack of both culture methods. One hundred and eighteen (n = 118) cases were collected for aerobic/anaerobic culture results by conventional culture media after aerobic/anaerobic cotton swabs (Transystem™, COPAN, Italia) and blood culture media (FAN) (BD BACTEC™, America) [Figure 1]. Convention media included chocolate agar, sheep blood agar, and thioglycolate broth at 37°C. Sabouraud agar plates were also obtained and maintained at 25°C to enhance fungal growth. Positive microbial cultures were defined as growth of the same pathogen on 2 or more culture media. The positive fungal culture was defined on morphology. The medical charts of patients receiving PK were reviewed. All the donor corneas were obtained from the National Eye Bank of Taiwan and American Eye Bank. Our study was approved by the Ethics Committee of the Chang Gung Memorial Hospital (IRB: 201600959B0). Clinical information including recipient characteristics, surgical details, and postoperative outcomes were collected and analyzed. Microbiological studies in corneoscleral rim were carried out during operation, using conventional culture media after aerobic/anaerobic cotton swabs and blood culture media (FAN), which were shown in [Figure 2]. The preserving solution of donor cornea (5 ml) was added to the Blood culture media (FAN). On the other hand, aerobic/anaerobic culture cotton swabs scraped donor corneoscleral rim surface and were soaked in the preserving solution of donor cornea, which further inoculated in conventional culture media. The remaining donor corneoscleral rim tissue was sent for fungus culture afterward. Contingency tables and mean values of recipient characteristics were analyzed between cases and controls using Chi-square test as described by McNemar for categorical variables. P < 0.05 is considered statistically significant. The mean age of our patients was 68 years old (range 7–89 years), and of them, 74 were male (62.7%), 44 were female (37.3%). The laterality was equally distributed with 61 right eyes (51.7%) and 57 left eyes (48.3%). 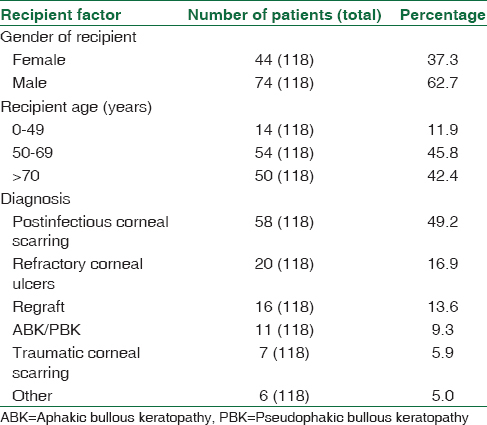 The leading indication for PK in our patients were postinfectious corneal scarring (n = 58, 49.2%), refractory corneal ulcers (n = 20, 16.9%), regraft (n = 16, 13.6%), aphakic or pseudophakic bullous keratopathy (n = 11, 9.3%), and traumatic corneal scarring (n = 7, 5.9%). The patient's characteristics of age, gender, diagnosis, and source of cornea are identified as shown in [Table 1]. 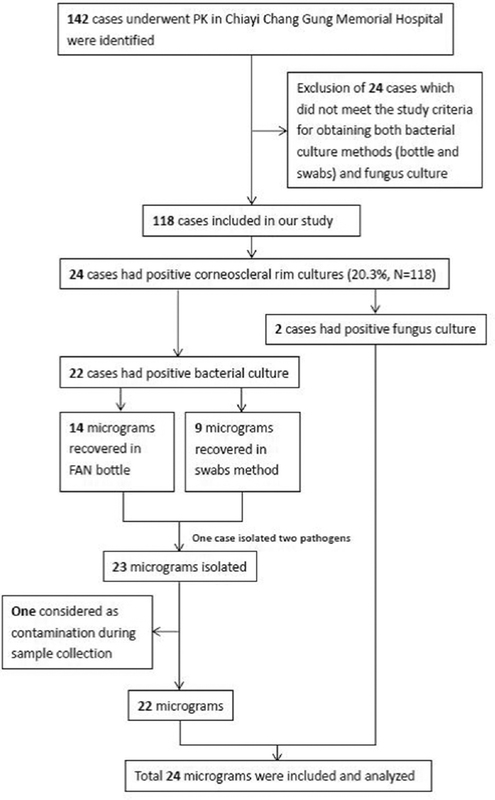 Microorganisms were recovered from 24 in total 118 cases (20.3%, n = 118), 14 by blood culture media (FAN) (11.8%, n = 118), 9 by conventional culture media after aerobic/anaerobic cotton swabs (7.63%, n = 118), and 2 in fungus culture (1.69%, n = 118). 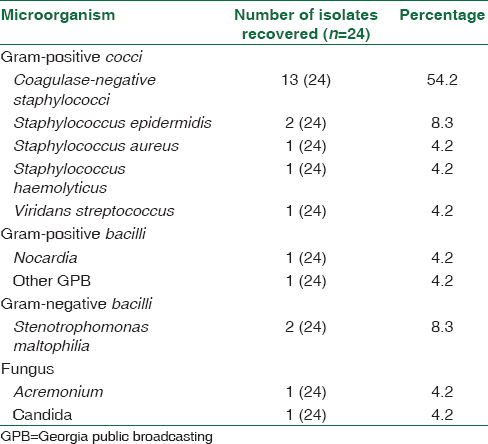 Pathogens identified and the culture methods used are shown in [Table 2]. Interestingly, pathogen recovered from blood culture system (FAN) was not identical to those recovered from swab culture system. Among 24 positive corneoscleral rim cultures, the most common pathogen identified was coagulase-negative Staphylococcus (CoNS) (n = 13, 54.2%), with decreasing frequency as follows: Staphylococcus epidermidis (n = 2, 8.3%), Stenotrophomonas maltophilia (n = 2, 8.3%), Staphylococcus aureus (n = 1, 4.2%), Viridans streptococcus (n = 1, 4.2%), Staphylococcus haemolyticus (n = 1, 4.2%), Nocardia spp. (n = 1, 4.2%), Gram-positive bacilli (n = 1, 4.2%), Acremonium (n = 1, 4.2%), and Candida spp. (n = 1, 4.2%). The microorganisms identified in our study were shown in [Table 3]. One case isolated two pathogens, CoNS in blood culture media (FAN) and Nocardia spp. in conventional culture media after aerobic/anaerobic cotton swabs, respectively. Otherwise, there was no pathogen identified in both methods. There was no correlation between these two methods using Chi-square test (χ2 = 0.005, P= 0.648). As compared with conventional culture media after aerobic/anaerobic cotton swabs, more isolates of CoNS and S. aureus (13 vs. 4, P= 0.052, Odds Ratio: 3.25) and V. streptococcus (1 vs. 0) were recovered from blood culture media (FAN). Conversely, more nonfermentative Gram-negative bacilli S. maltophilia (2 vs. 0) and Gram-positive bacilli (1 vs. 0) were recovered from conventional culture media after aerobic/anaerobic cotton swabs. None of the 24 cases with positive corneoscleral rim cultures resulted in ocular infection of the recipient for at least 6 months' follow-up. The most significant finding of the present study was that conventional culture media after aerobic/anaerobic cotton swabs and blood culture media (FAN) did not yield identical isolates of bacteria. That was, either culture system had its own advantages and limitations in yielding the bacteria residing the corneoscleral rim. This issue became complex since evolving techniques, such as adding effective spectrum antibiotics in preservation mediums, were developed. It was reported that the combination of gentamicin and streptomycin in 4°C significantly improve anti-microbial activity against S. aureus, S. epidermidis, Propionibacterium acnes, Escherichia More Details coli, and Pseudomonas aeruginosa, which were common pathogens leading to postoperative endophthalmitis. The present study included cases after the year 2000 to meet the current standards as storage media, culture techniques, and transplantation technique. We found that the conventional medium only yield 7.6%, while blood culture media (FAN) recovered 11.8%. With the advances in disinfection techniques such as better iodine sterilization of donor, and adding antibiotics in preservation medium, a lower rate of 7.6% for positive corneoscleral rim culture by conventional media was shown as compared to literature that ranged from 11% to 39%. However, the blood culture media (FAN) could further yield bacterial isolates that were not recovered by convention media. It seemed adding gentamycin could achieve bacteriostatic effect instead of the bactericidal effect. These results supported the continuity of antibiotic usage in the donor until the local immunity was completely recovered. In literature, direct inoculation and swab with subsequent convention medium have been employed for corneoscleral rim culture.,,,,, However, it seemed the positive rate would be underestimated if there were antibiotics in the preservation medium. Blood culture media (FAN), which contains agents for neutralization of antibiotic, seemed more logical for corneoscleral rim culture because of the antibiotics in the preservation medium.,, We did find a further detection of Gram-positive pathogen in this method. More isolates of CoNS and S. aureus were recovered in blood culture media (FAN) as compared to conventional culture media after aerobic/anaerobic cotton swabs (13 vs. 4) in the present study. It has been reported that the medium contained in FAN bottles have been shown superior recovery for Staphylococci. In spite of the limited case number, it was noteworthy that using blood culture media (FAN) could recover more CoNS and S. aureus in corneoscleral rim cultures which was reported clinically significant species following keratoplasty. Besides, discrepancies of recovered microbial pattern between these two methods were probably partially explained by lower oxygen content in FAN bottles. For example, S. maltophilia, which is strictly dependent on the oxygen concentration of the medium was only recovered in conventional culture media in the present study, could be associated with the lower oxygen content in FAN bottles. Similarly, it was also possible that more nonfermentative Gram-negative bacilli were recovered in conventional culture media because of higher oxygen tension. Controversy in prevailing pathogens existed in microbial keratitis following PK in Taiwan., Chen et al. have demonstrated the most frequently isolated microbes were Gram-negative microbes (50%), fungus (26%), and Gram-positive microbes (24%), which is contrasted by Sun et al. as Gram-positive microbes (58%), Gram-negative microbes (22%), and fungus (20%)., In Germany, the contamination rate and spectrum of microbes in 3306 organ-cultured donor corneas were shown that the most frequently isolated microbes were Enterococci (19%), Staphylococci (10.8%), and Candida (37.4%). While in the National Eye Bank of Taiwan, 39 out of 232 collected donor corneas isolated microbes (16.8%), with Staphylococcus species (57%) predominant. Because of the changing microbial environment in different region across time, the methods to recover the truly existed microbes seemed important. In the current study, we have shown that combination of blood culture media (FAN) and conventional culture media after aerobic/anaerobic cotton swabs could recover the wide spectrums of microbes existing in the corneoscleral rim. Even though several recent studies challenged the cost-effectiveness of corneoscleral rim culture, it was evident that a positive corneoscleral culture was associated with 5 times more frequent among recipients developing endophthalmitis than among negative culture., Postoperative infection is the most disastrous complication of PK.,, Several studies emphasized on early diagnosis and treatment based on culturing of the preservation medium.,, If local medical therapy for infection succeeded, early removal of the infected corneal graft may be prevented. Therefore, the corneoscleral rim culture at transplantation did provide important clinical information for the ophthalmologist. The current study was limited by small number of patients. However, it revealed different patterns of bacterial isolate from the two culture system. Longer term follow-up is suggested. The aerobic/anaerobic cotton swabs system with convention media and blood culture media (FAN) did not yield identical isolates of bacteria. The blood culture media (FAN) bottle could further recover Gram-positive bacteria in addition to those recovered from convention media. It seemed adding gentamycin and streptomycin could achieve bacteriostatic effect instead of bactericidal effect. The administration of postoperative antibiotics in the recipient was suggested. Krachmer JH, Holland EJ, Mannis MJ. In: Cornea, 2nd ed. Vol. 2. Surgery of the Cornea and Conjunctiva, Corneal Surgery: Elsevier; 2005. Chen HC, Lee CY, Lin HY, Ma DH, Chen PY, Hsiao CH, et al. Shifting trends in microbial keratitis following penetrating keratoplasty in Taiwan. Medicine (Baltimore) 2017;96:e5864. Sun JP, Chen WL, Huang JY, Hou YC, Wang IJ, Hu FR, et al. Microbial keratitis after penetrating keratoplasty. Am J Ophthalmol 2017;178:150-6. Sung MS, Choi W, You IC, Yoon KC. Factors affecting treatment outcome of graft infection following penetrating keratoplasty. Korean J Ophthalmol 2015;29:301-8. Antonios SR, Cameron JA, Badr IA, Habash NR, Cotter JB. Contamination of donor cornea: Postpenetrating keratoplasty endophthalmitis. Cornea 1991;10:217-20. Cameron JA, Antonios SR, Cotter JB, Habash NR. Endophthalmitis from contaminated donor corneas following penetrating keratoplasty. Arch Ophthalmol 1991;109:54-9. Cornish KS, Ramamurthi S, Butcher I, Ramaesh K. Is microbiological analysis of donor cornea transport culture media necessary? Eur J Ophthalmol 2009;19:137-8. Everts RJ, Fowler WC, Chang DH, Reller LB. Corneoscleral rim cultures: Lack of utility and implications for clinical decision-making and infection prevention in the care of patients undergoing corneal transplantation. Cornea 2001;20:586-9. Matsumoto M, Suzuma K, Miyamura N, Imamura N, Kitaoka T. Conjunctival swabs and corneoscleral rim cultures from corneal transplantation donors as possible early indicators for posttransplant endopthalmitis. Jpn J Ophthalmol 2011;55:321-6. Wilhelmus KR, Hassan SS. The prognostic role of donor corneoscleral rim cultures in corneal transplantation. Ophthalmology 2007;114:440-5. European Business Aviation Association (EBAA). America EBAo: Medical Standards. Washington: EBAA; 2015. Association EEB. Technical Guidelines for Ocular Tissue, Prague, Czech Republic: Association EEB; 2017. Al-Assiri A, Al-Jastaneiah S, Al-Khalaf A, Al-Fraikh H, Wagoner MD. Late-onset donor-to-host transmission of Candida glabrata following corneal transplantation. Cornea 2006;25:123-5. Alharbi SS, Alrajhi A, Alkahtani E. Endophthalmitis following keratoplasty: Incidence, microbial profile, visual and structural outcomes. Ocul Immunol Inflamm 2014;22:218-23. Chen JY, Jones MN, Srinivasan S, Neal TJ, Armitage WJ, Kaye SB, et al. Endophthalmitis after penetrating keratoplasty. Ophthalmology 2015;122:25-30. Ritterband DC, Shah MK, Meskin SW, Shapiro DE, Seedor JA, Koplin RS, et al. Efficacy and safety of moxifloxacin as an additive in optisol-GS a preservation medium for corneal donor tissue. Cornea 2006;25:1084-9. Wilson ML, Weinstein MP, Mirrett S, Reimer LG, Feldman RJ, Chuard CR, et al. 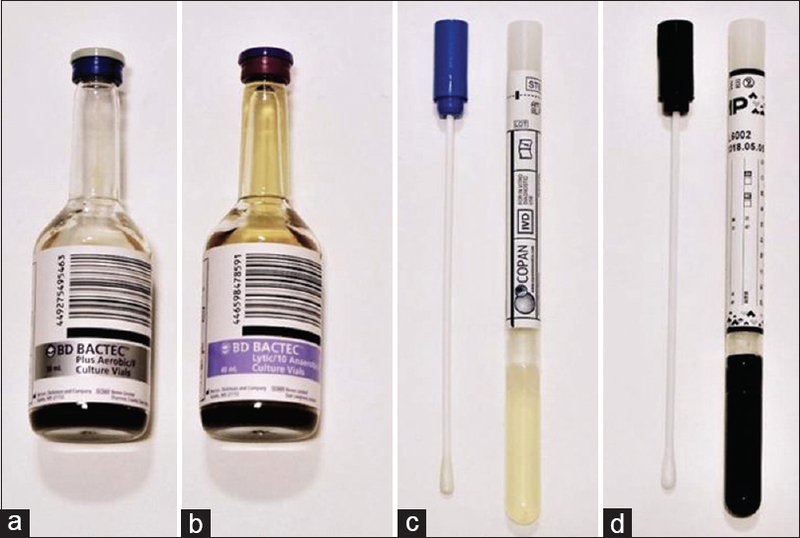 Controlled evaluation of BacT/alert standard anaerobic and FAN anaerobic blood culture bottles for the detection of bacteremia and fungemia. J Clin Microbiol 1995;33:2265-70. Portillo ME, Salvadó M, Trampuz A, Siverio A, Alier A, Sorli L, et al. Improved diagnosis of orthopedic implant-associated infection by inoculation of sonication fluid into blood culture bottles. J Clin Microbiol 2015;53:1622-7. Bourbeau P, Riley J, Heiter BJ, Master R, Young C, Pierson C, et al. Use of the bacT/Alert blood culture system for culture of sterile body fluids other than blood. J Clin Microbiol 1998;36:3273-7. Smith TM, Popplewell J, Nakamura T, Trousdale MD. Efficacy and safety of gentamicin and streptomycin in optisol-GS, a preservation medium for donor corneas. Cornea 1995;14:49-55. Kiatos E, Armstrong JJ, Hutnik CM, Tsioros SM, Malvankar-Mehta MS, Hodge WG, et al. The value of corneoscleral rim cultures in keratoplasty: A systematic review and cost-effectiveness analysis. Clinicoecon Outcomes Res 2017;9:459-74. Inomata T, Ono K, Matsuba T, Shiang T, Di Zazzo A, Nakatani S, et al. Pre-banking microbial contamination of donor conjunctiva and storage medium for penetrating keratoplasty. Jpn J Ophthalmol 2017;61:369-77. Melo GB, Bispo PJ, Yu MC, Pignatari AC, Höfling-Lima AL. Microbial profile and antibiotic susceptibility of culture-positive bacterial endophthalmitis. Eye (Lond) 2011;25:382-7. Gruenert AK, Rosenbaum K, Geerling G, Fuchsluger TA. The influence of donor factors on corneal organ culture contamination. Acta Ophthalmol 2017;95:733-40. National Eye Bank of Taiwan, editor. National Eye Bank of Taiwan, Annual report. Taipei: National Eye Bank of Taiwan; 2015. Röck D, Wude J, Bartz-Schmidt KU, Yoeruek E, Thaler S, Röck T, et al. Factors influencing the contamination rate of human organ-cultured corneas. Acta Ophthalmol 2017;95:e706-12. Ple-plakon PA, Shtein RM, Musch DC, Blachley T, Saponara F, Woodward MA, et al. Tissue characteristics and reported adverse events after corneal transplantation. Cornea 2013;32:1339-43. Fasolo A, Capuzzo C, Fornea M, Franch A, Birattari F, Carito G, et al. Risk factors for graft failure after penetrating keratoplasty: 5-year follow-up from the corneal transplant epidemiological study. Cornea 2011;30:1328-35. Jambulingam M, Parameswaran SK, Lysa S, Selvaraj M, Madhavan HN. A study on the incidence, microbiological analysis and investigations on the source of infection of postoperative infectious endophthalmitis in a tertiary care ophthalmic hospital: An 8-year study. Indian J Ophthalmol 2010;58:297-302. Pinna A, Zanetti S, Sotgiu M, Sechi LA, Fadda G, Carta F, et al. Identification and antibiotic susceptibility of coagulase negative staphylococci isolated in corneal/external infections. Br J Ophthalmol 1999;83:771-3. Schotveld JH, Raijmakers AJ, Henry Y, Zaal MJ. Donor-to-host transmitted candida endophthalmitis after penetrating keratoplasty. Cornea 2005;24:887-9.